Full color version of the latest book for suspended Amazon sellers and sellers that want to avoid being suspended or losing their top ASINs. 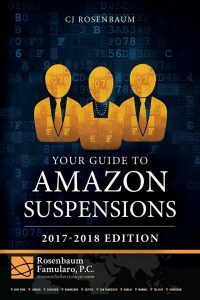 This book teaches Amazon sellers how to get their individual ASINs reinstated if they are suspended. There are two main goals of this book: Educate Amazon sellers about how to avoid suspensions and teach suspended Amazon sellers how to get their accounts and ASINs quickly reinstated. Amazon sellers can use what we have learned after helping thousands of suspended Amazon sellers to maintain their selling privileges and use the information and sample Plans of Action to get your selling privileges reinstated as soon as possible. Rosenbaum Famularo, PC, helps ecommerce sellers around the world, who sell on a variety of online platforms, protect their intellectual property rights and overall brand. This book focuses on informing our sellers about protecting their brand and the steps that can be taken to prohibit infringers. We will discuss both trademark and copyright law, the two primary ways to protect your brand. Educate online sellers about trademark law and how it affects them, and to teach online sellers how to protect their trademarks from infringement or avoid infringing on others. Rosenbaum Famularo, PC helps ecommerce sellers around the world. Our clients sell on Amazon and other online platforms. We help develop and protect sellers’ brands and their intellectual property rights. 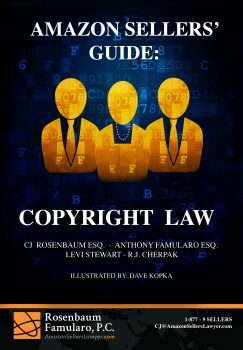 This book focuses on teaching Amazon sellers about United States copyright law. A copyright by definition covers: literary, musical, dramatic works, pantomimes, choreographic works, pictorial, graphic, sculptural works, motion pictures, sound recordings, and architectural works. It is important for sellers to know how to properly file a copyright, and to understand under what conditions a copyright protects. Avoid problems before they arise by protecting your brand from the start. This book focuses on informing Amazon sellers about protecting their brand from threats located in China and steps sellers can take to prohibit infringers. We discuss trademark and copyright law, the two primary ways to protect your brand around the world. The Chinese marketplace is booming and ripe for investment. The development of ecommerce companies like Amazon, Alibaba, and eBay have provided the keys to the global marketplace for corporations and individual sellers to market their products worldwide. As such, it’s absolutely paramount that sellers understand their IP rights in China. 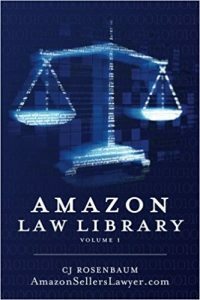 Intended to be a “bible” of all legal issues surrounding Amazon and the use of its online platform. This book contains summaries of nearly every case Amazon has litigated within the past several years. The book is broken down into 3 sections, all of which have been written in everyday or “layman’s” terms in order to make the material accessible to anyone, whether they have a legal background or not. Section 1 is the Table of Contents. Section 2 is the Annotations Section; defining what each category will cover and providing concise summaries of each case found in its section. Section 3 contains full case summaries and breaks down each case by its issue, rule, facts, analysis and conclusion. Fashion is your passion. 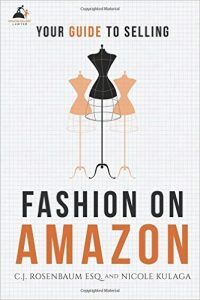 Whether you are a new or existing designer, chances are you have been on the Amazon platform. In this book, we will explain why Amazon is a great option for designers and how to keep your business safe from suspension. It is not easy starting your own business, there are many risks, but selling on Amazon opens many doors for entrepreneurs. This book will be your how-to guide on everything from legal issues to selling on Amazon. Congratulations on taking the plunge and escalating your business practice to the Amazon world. This book was written with a designer’s thoughts and concerns in mind and we are thrilled to be on this journey with you.